A perfect balance between beauty and strength exists. The radiant-cut diamond features the perfect balance between resilience and elegance – just like your partner. Cropped corners surround a perfectly square or rectangular shape, creating proportions that give this diamond cut a brilliant sparkle and durable structure unmatched by other sophisticated shapes. Each radiant-cut diamond offers the ideal brilliance for a high-end look without compromise. Radiant-cut diamonds exhibit a highly sought after modern and sophisticated look. Featuring a distinctly rectangular or square shape with cut corners, the radiant-cut diamond is among one of the most popular elegant diamond shapes. Radiant diamonds are relatively new to the jewelry industry. Introduced just a few generations ago, the radiant-cut has become a popular choice for center stones in fine jewelry pieces such as engagement rings. What Makes Radiant-Cut Diamonds So Durable? Radiant-cut diamonds offer enhanced durability due to their cut corners. In comparison to other diamond shapes, the radiant shape is also less prone to chipping or catching. One of the most notable features of a radiant-cut diamond is its exceptional brilliance and depth. This diamond cut features a unique hybrid cut with 70 facets and cropped corners. Extra facets disperse more light through a radiant-cut diamond, helping it become one of the more brilliant square or rectangle-shaped diamond cuts. If you are looking for a resilient diamond that sparkles brilliantly and features a modern, high-end look, the radiant-cut may be ideal for your taste. How are Radiant-Cuts and Princess-Cuts Different? While the shapes of these two cuts are very similar to one another, princess-cuts are mostly square with sharp edges. On the other hand, the radiant-cut are either square or rectangular with cut corners. Because of its cut corners, the radiant diamond is well-suited to those with more active lifestyles as it does not have sharp corners that may get caught or chipped with a minor bump or impact. Modern princess-cut diamonds have 76 chevron-shaped facets, a vertically cut pavilion, and feature a distinct “X” shape at the center. The radiant-cut features a higher crown and smaller table. Thanks to its highly-unique facet patterns, this cut also features a distinct circular pattern when viewed from the top. The radiant-cut diamond's brilliant sparkle makes it a top choice diamond shape for engagement rings and other romantic jewelry pieces. Princess-cut diamonds feature reflections that consist of fewer colors due to their contrasting facets. This results in a near-colorless diamond, which experts consider ideal. Compared to radiant-cut diamonds, princess-cuts tend to cost less because they are typically cut from a rougher diamond. 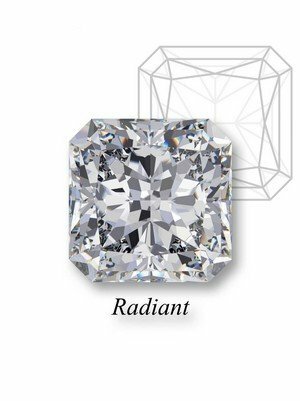 When considering the differences between a radiant-cut and a princess-cut diamond for purchase, it is worthwhile to make a mental note of the above differences. However, the biggest deciding factor should always be your personal preference. If you are looking for a modern, elegant diamond shape that suits active lifestyles, then the radiant-cut diamond may be your ideal diamond shape. The weight of the diamond is measured using the carat system. GSL uses specialized scales to ensure an accurate weight measurement – the weights are measured to the hundred-thousandths of a carat. With the carat system, one metric carat is equal to 0.2 gram. That's why expert measurements and calibrated tools matter so much when it comes to determining diamond quality. Radiant-cut diamond clarity refers to the appearance of the stone, and it notes any blemishes or inclusions. The GSL grades square diamond clarity as one of six grades – Flawless, Internally Flawless, Very Very Small Inclusions, Very Small Inclusions, Small Inclusions, or Imperfect. If your partner prefers a more flawless appearance for their diamond jewelry, you’ll want to choose a Flawless or Internally Flawless diamond. If small imperfections do not stand out to your partner, then a Very Small Inclusions or Small Inclusions grade may be preferred. Using the GSL ratings for clarity can help you to understand your preferences for radiant-cut diamond clarity. Because radiant-cuts have many facets and angles, they feature a “crushed ice” look, which more easily hides minor inclusions and flaws. The industry standard for grading radiant-cut diamond color is a system that begins with a D grade (colorless) and continues with increasing levels of color to a Z grade. Diamonds are compared to master stones with known color grades. In fact, GSL utilizes master stone sets that are chosen based on rigorous standards then tested prior to use. To the naked eye, diamond color is closely tied to the size of the radiant-cut diamond and the setting. Small differences in diamond color are usually difficult for the human eye to perceive. However, differences in color are more visible with radiant-cut diamonds compared to other diamond shapes. With this in mind, you may want to look for a radiant diamond with a slightly higher color grade. Additionally, the setting color and material chosen for the radiant-cut diamond can make an immense difference in the color of the diamond. Ideally, a diamond should always look colorless against its setting, so keep in mind what the setting will look like when shopping for diamond color. The proportions of a radiant-cut diamond determine how brilliantly the diamond will shine. Grading of a diamond’s cut is determined by examining its angles, facets, and polish. Overall, the goal of attaining a good cut of diamond is to create a diamond that has the correct proportions to allow the maximum amount of light to travel through it. This will give the diamond a beautiful sparkle that your partner will love. With radiant-cut diamonds, the length-to-width ratio of the diamond is important to consider. This ratio determines how proportional the diamond is to its intended shape, and preferences for ratios are entirely subjective. Commonly, radiant-cut diamonds that have a 1.00 to 1.35 length-to-width ratio are most sought after. However, personal preferences also play an important role in deciding which length-to-width ratio looks best. A radiant-cut with a longer, more-rectangular shape carries a higher risk of having what is called the “bow-tie effect”. This optical effect occurs when a dark area runs across the center of the stone, resembling a bow-tie. Since the angle of the cut can adversely affect brilliance by causing light to leak out of the stone, experts tend to consider this effect a flaw. Each diamond is given one of the following grades for cut: Ideal, Excellent, Very Good, Good, Medium, Fair, or Poor. A high-quality diamond cut will feature proportions that allow optimal light reflection through the crown and table, giving off a beautiful, brilliant sparkle. In 1977, Henry Grossbard created the radiant-cut with the goal of inspiring more interest in square and rectangular diamond shapes. To attain this, Grossbard blended the techniques and structures behind the already-popular Emerald and Brilliant Round shapes to create the vivacious sparkle and famous durability now synonymous with the radiant-cut. As a result, the radiant-cut first gained popularity in the 1980s, continuing to top engagement ring wish lists today. The radiant-cut diamond was the first diamond cut to feature a brilliant facet pattern on both the crown and pavilion. This shape owes its incredible sparkle to its 70 facets. In fact, the only diamond cut that surpasses the radiant-cut in brilliance is the round brilliant shape. As a relatively new cut on the fine jewelry market, the radiant-cut diamond began gaining popularity in the 1980s. These elegant and modern diamonds have a square or rectangular shape with cropped corners – and they are quickly becoming a favorite of jewelers for use as the center in romantic pieces such as engagement rings. Featuring exceptional brilliance and great durability, the radiant-cut is perfect for those who demand exceptional sparkle without having to baby the stone. For modern beauty in a durable, brilliant diamond, explore Zales radiant-cut diamonds.